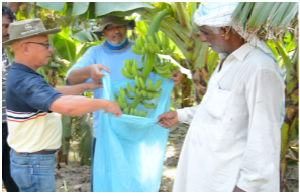 Mr.Raheel and other bananas farmers in the area generally observe low bunch weight (12-15kg); which is far below the international production of 30 to 35 kilograms per bunch. Quality of banana is also far below than the international quality specification for premium fruit of a minimum length of 8 inches and girth of 40mm. Raheel Shah’s banana plantation is currently averaging an annual yield of only 8 to 10 metric tons per acre. Wastage is high owing to lack of proper bunch care during fruit development and poor handling after harvest. The quality and yield of bananas suffered primarily due to use of flood irrigation, high population density of plants, poor planting pattern, lack of proper bunch management, improper application of fertilizer and limited plant nutrition management. Improper handling of fruit after harvesting causes damage to fruit, reducing shelf-life and revenues. Agribusiness Support Fund (ASF) engaged international banana experts and developed a strategy to address key issues that could result in long-term and sustainable changes in quality and yield of bananas for Raheel and other farmers. ASF’s strategy included immediate measures for current crop, more elaborate improved practices for next cropping season and establishment of model farms for long-term sustainable improvement in the sector. Immediate measures to improve the current crop between October and December 2014 comprises of improved bunch care. 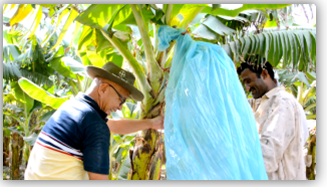 Bunch care training has been provided including removal of obstacles that can cause blemishesto the bananas, removal of unwanted hands and fingers to allow maximum fruit development and make better cosmetic looks of the fruits at harvest. The use of bunch covers (polyethylene bags) is also introduced to protect fruit from subsequent damage by insects. These measures are expected to increase bunch weight from 12-15kg to 25kg, increase production per acre from 8 metric tons per year to 25 metric tons per year. In terms of quality improvements, 60% of total fruit is expected to be A & B class for export. Fruit recovery will be increased to 95% and wastage reduced to 5% or less. Mr. Raheel Shah summed up his experience over the past few months with ASF supported establishment of a model farm and technical assistance and training provided through an Australian based company; “I am grateful to ASF for helping us improve the quality and reduce costs of bananas. In addition to quality improvements we expect a 30% increase in earnings from this crop. Now I am planning to increase the new planting pattern to 70 acres.” Mr. Raheel Shah and other farmers are already seeing the benefits of improved practices. Mr. Javaid Ali Khoro, another farmer who visited Raheel’s model farm implemented improved practices at his farm and later became one of the model farmers. He is planning to increase the new planting pattern over 270 acres by next year. Large number of farmers is now visiting these model farms to benefit from improved practices. Banana is cultivated on an estimated 85,990 acres in Pakistan of which 87% is grown in the Sindh province. The Dwarf Cavendish variety accounts for 95% of the banana- grown and only a few growers are beginning to experiment with Grand Naine tissue culture plants imported from India. The Dwarf Cavendish variety has been grown in Pakistan for the last 60 years exhibiting adaptability to extreme climatic conditions of strong winds, very high summer temperatures and cold frost during winter. Mr. Raheel Shah is an established commercial banana grower in TandoAllahyar in Sindh. His father started their family agribusiness some 67 years ago. He now cultivates bananas, mangoes, onions and other crops on 45 acres. Raheel is now growing bananas on 70 acres. Measures implemented for the next cropping season includes plant population control, replacement of flood irrigation that saturates plant roots and affects nutrient uptake from the soil, introduction of a scientific fertilizer program based on soil testing in addition to proper bunch care. a. A maximum population of 1000 plants per acre is being implemented compared to local average of 1500-2400 plants per acre, necessitating removal of excess plants b. Irrigation canals are advised after every five meters and sprinkler or drip irrigation system is suggested c. Balanced nutrition through an optimized fertilizer regime Long-term strategy includes establishment of model plots at Mr. Shah’s farm and seven other progressive farmers in the area to illustrate a more optimal planting pattern in addition to above improvements. He planted four acres of a more internationally acceptable Grand Naine variety with technical assistance from the Agribusiness Support Fund and replicated another four acres on the same pattern.The new planting pattern included double hedgerow planting, optimally spaced irrigation canals, proposition of micro-sprinkler irrigation solutions, a more suitable fertilizer program for better plant nutrition and use of planting materials and modern tools.